Sean Dyche has been in charge at Burnley since October 2012. Burnley hope to still have manager Sean Dyche in charge at the start of next season, says new sporting director Frank McParland. 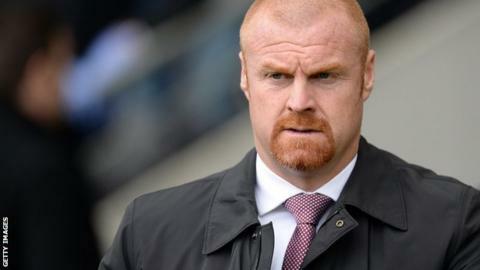 Dyche has been linked with the vacant post at Sunderland after Burnley's relegation to the Championship. "I'm not surprised [by the rumours]," McParland told BBC Radio Lancashire. "I know he's very happy here, he was a big part of me coming here and I'm really hopeful we'll both start off the season here." The 43-year-old former Watford boss guided Burnley to automatic promotion to the Premier League in his first full season after replacing Eddie Howe. Despite having one of the lowest budgets in the top flight, the Clarets were competitive for the majority of the season before being relegated with two games to go. Former Liverpool academy manager McParland, 46, has started work at Turf Moor this week after a two year spell as sporting director at Brentford. "I think we're in good shape, the club is financially sound and I think we'll do things properly in terms of due diligence on players," he added. "For sure, there will be players coming in during the summer."